It’s Throwback Thursday so let’s go back through Upper Deck’s trading card history and come up with a fun giveaway. We are two days away from the NCAA® Men’s Basketball Final Four and although it is pretty certain that your bracket is nothing to pay attention to at this point, the coaching surely is! When it comes down to the latter end of playoffs, coaching styles and methods can have a major influence on players both mentally and physically. 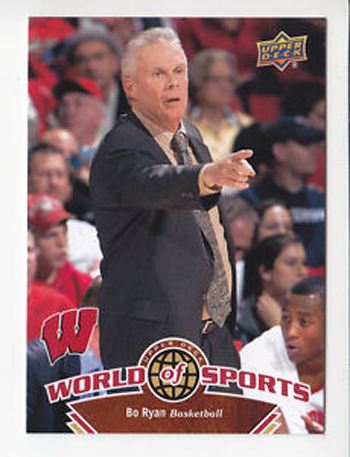 Coach Bo Ryan of the Wisconsin Badgers believes executing fundamentals is the key to not only winning a game, but a championship. So let’s put up a throwback card and see if our fans can come up with some great captions for the card! Please share your comical caption to this card for your opportunity to score Five (5) packs of SP Authentic Basketball! You have until Friday morning, April 4 at 8:00 a.m. PT to post your caption before this promotion is closed. Only the customer selected to receive the promo card set will be contacted via email, so please make sure to provide an accurate email address when you leave your comment. Hey, Bucky, North Texas is that way! Is concession stand that way? We’ve talked about this before, you can’t go wearing just your heart shapped pink underwear to games suzie! UCONN and Kevin Ollie will prevail!! Hey you, put your hand down and quit laughing, everyone already knows it was you who farted. Keep your hands off my mama and keep your hands off my Doritos!!! I know I burned you last time with this one, but “pull my finger”. Hey, did you take my Cheetos? fastest gun in the midwest Bang Bang! Crap, who let Kentucky in the Final Four??? I thought they were headed to the NIT this year??? Hey You! Yes You! You picked who? Kansas? You know this is the big dance right? Kansas always chokes in the big dance! Abracadabra, my magic finger will help us win! Look Ma, I can control the players with my finger! That guy in the second row, on the other side is wearing the same tie as me. “Because YOU, You Light Up MY LIFE! You give me hope, to carry on! Hey! Those don’t look like the Xs and Os on my chalkboard! Officer, that’s the guy…… The one in the stripes….. This is a stickup look at these five guys standing there with their hands in the air. You can’t say that about me! I have my own trading card! Daniel M. takes the cake this week! Congrats, your comical comment scored you five packs of SP Authenticated Basketball! Thank you everyone for participating and enjoy watching the Final Four this weekend!